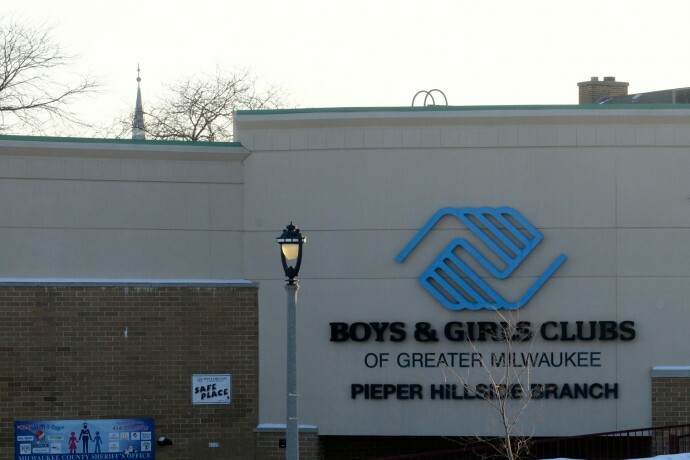 A new Public Policy Forum report is raising questions about the state of afterschool programming and YoungStar staff education standards in Milwaukee County. The nonpartisan organization’s study, “Reaching for the Stars,” reveals that afterschool programs are struggling to meet staff education requirements set under YoungStar. The resulting education gap is producing low ratings—and lowered state subsidies—for afterschool programs, fewer than 1 percent of which had received 4- or 5-star ratings as of June 2013. YoungStar’s standards require afterschool staff to meet education requirements similar to those for early childhood care providers. According to the report, however, some afterschool providers who work with school-age children are questioning whether requirements designed for the early childhood setting should apply to their programs. The ratings are clear, according to researcher Joe Peterangelo, the study’s chief author, but their implications are not. 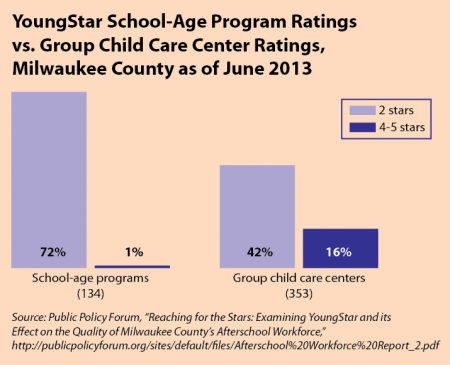 The report states that 72 percent of the 134 school-age programs in Milwaukee County evaluated by YoungStar received 2-star ratings. 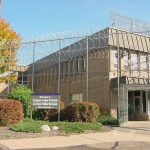 The Wisconsin Department of Children and Families (DCF) considers “high quality” programs to be rated 3 stars and above, according to an emailed statement. Programs must be evaluated by YoungStar to receive Wisconsin Shares child care subsidies, which are tied to ratings. Programs with 4 and 5 stars receive 10 and 25 percent base rate increases, respectively. Two-star programs receive a 5 percent reduction. The lower ratings have led to an overall decrease in state funding for county school-age programs, according to Peterangelo. The programs’ ratings compare poorly with those of group child care centers, 42 percent of which have 2-star ratings and 16 percent of which have 4- or 5-star ratings. YoungStar launched in 2010. Originally focused on early childhood care, the system began evaluating afterschool care providers in 2012. The Wisconsin Department of Children and Families established its school-age criteria through the Wisconsin Afterschool Network, which includes organizations such as Milwaukee Public Schools (MPS) and YMCA of Metropolitan Milwaukee. The criteria were based on standards for group childcare centers, according to the Forum’s report. YoungStar evaluates programs in four categories, including staff education. To reach the 3-star level, half of the teachers in school-age programs must have earned six credits in early childhood education or child development, according to the report. Those standards are necessary and important, according to DCF. Staff education is the primary reason why many county afterschool programs cannot reach 3-star status, Peterangelo said. According to the report, more than 80 percent of all teachers in the 2-star programs do not meet the education requirements for higher ratings. That disparity may be the product of low-quality afterschool programs, Peterangelo said, but it might also mean that the state should reconsider how it applies early childhood care-based standards to afterschool programming for older children. Unlike early childhood care services, afterschool programs typically rely on part-time, non-career workers with high turnover rates, according to Baldwin. The fields’ business models also differ, she added. Early childhood programs can bill for the entire day, whereas afterschool services can only charge for a few hours at a time. “What it means is that it is very challenging for [afterschool] providers to invest in frontline workers for credit-based education,” Baldwin said. The Forum’s report estimates that it would cost between $430,000 and $1.1 million to cover the tuition necessary to bring all of the staff in county school-age programs up to 4-star education levels. There are multiple options available for area afterschool programs that seek to improve their staff education levels, according to DCF. The department offers technical consulting and micro-grants to afterschool programs. Teacher Education Assistance for College and Higher Education (TEACH) scholarships also provide assistance to qualified programs’ staff. According to the Forum’s report, however, few of these options have been used for staff education in Milwaukee County. 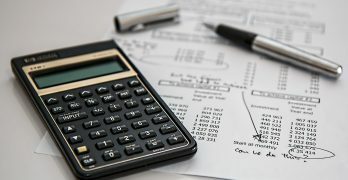 The report stated that none of the 111 county school-age programs that received $1,000 micro-grants between Sept. 1, 2012, and Sept. 1, 2013, applied the money to credit-based staff education, and only three teachers of school-aged children received TEACH scholarships during the federal fiscal year that started Oct. 1, 2012. Despite those challenges, a number of programs across the state have improved their ratings. According to DCF, 46 afterschool programs improved from 2 stars to 3 between March 1, 2013, and March 1, 2014. 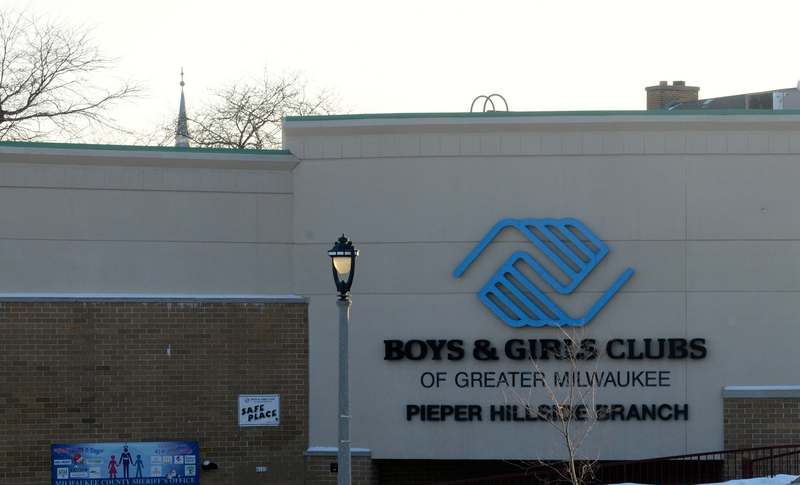 In Milwaukee County, Boys & Girls Clubs of Greater Milwaukee (BGC) is succeeding. The majority of its afterschool programs have 3-star ratings and several are higher-rated—the result of “quite a bit of effort” on the organization’s part since 2012, according to Knutson. BGC partnered with MPS, Milwaukee Area Technical College (MATC) and United Neighborhood Centers of Milwaukee to procure Workforce Advancement Training (WAT) grants for MATC. The grants “provided critical support” in creating a new school-age curriculum at MATC and funding staff tuition, Knutson said. MATC trained approximately 125 BGC staff, allowing most of BGC’S programs to meet or exceed 3-star criteria, according to Knutson. According to both Peterangelo and Knutson, however, BGC’s approach may not be easily reproducible, due to WAT eligibility restrictions. Additionally, turnover remains a continual issue for BGC, Knutson noted. “There’s a constant churn of new training and staff” that incurs thousands of dollars in training costs, he said. 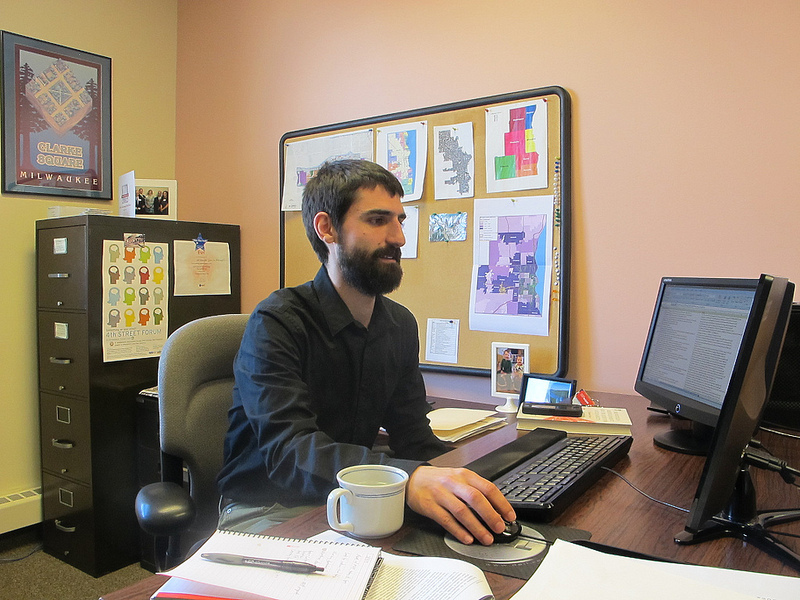 Other organizations, such as the YMCA of Metropolitan Milwaukee, face similar struggles. According to the study, the agency operates 33 afterschool and early childhood care programs, 29 of which are rated 2-stars. For the organization’s four higher-rated programs, staff education “poses the greatest challenge,” according to the report.